This entry was posted in Composers, Film Music, Interviews and tagged "This Is Me", Benj Pasek, Bobby Lopez, Coco, Justin Paul, Kristen Anderson-Lopez, Remember Me, The Greatest Showman, Variety on January 3, 2018 by Jon Burlingame. Benj Pasek and Justin Paul are among this country’s most talented and sought-after songwriters, so when Fox asked me to do a live Q&A with them following a Society of Composers & Lyricists screening of The Greatest Showman at 20th-Century Fox, I jumped at the chance. If you don’t know their names, you almost certainly know their music: They have already won the Oscar for La La Land and the Tony for Dear Evan Hansen, and their songs for A Christmas Story were heard during Fox’s recent live telecast of the musical. (They also wrote my favorite TV song of last year, “Runnin’ Home to You” for The Flash.) Their song “This Is Me” is certainly a contender for the Best Song Oscar. This entry was posted in and tagged "This Is Me", Benj Pasek, Justin Paul, Pasek & Paul, Society of Composers & Lyricists, The Greatest Showman on December 19, 2017 by Jon Burlingame. Pasek & Paul’s new songs for Hugh Jackman & Co. 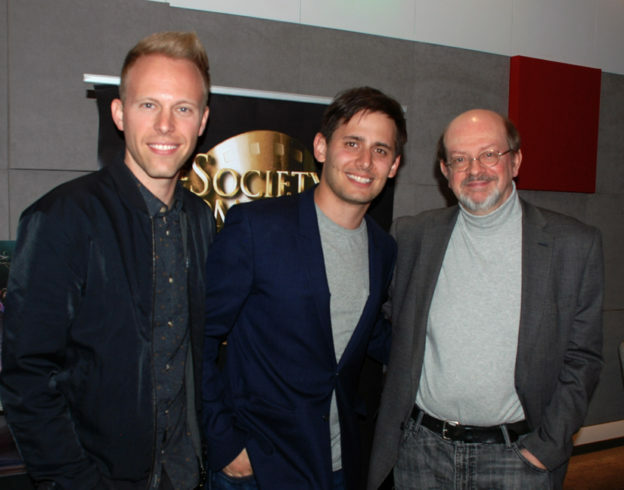 It was a genuine thrill to be the first journalist allowed to hear the songs that Oscar- and Tony-winning tunesmiths Benj Pasek and Justin Paul have penned for the upcoming Hugh Jackman film The Greatest Showman (debuting at Christmas), a musical biopic of the legendary P.T. Barnum. 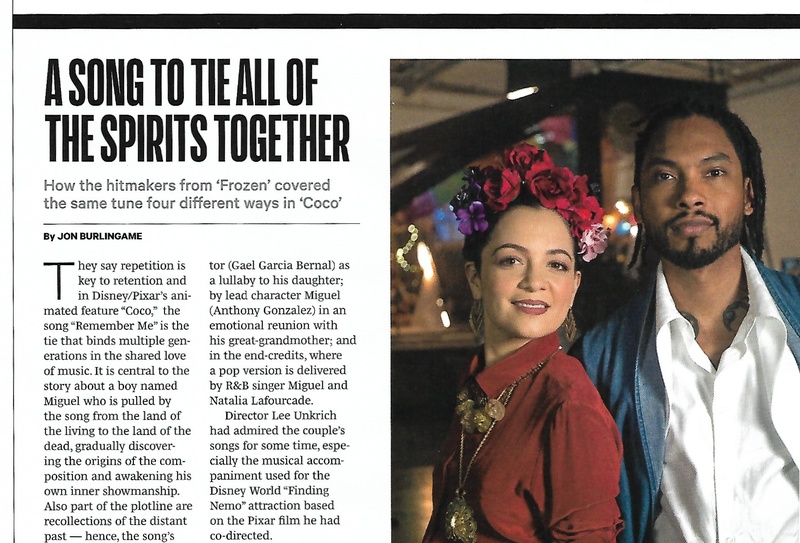 It’s the lead music story in this week’s Variety, and includes a brief look at four of the songs, plus interviews with the songwriters, Jackman and director Michael Gracey. I don’t think it’s an exaggeration to say that Pasek & Paul are today’s hottest musical-theater writers, only a few months after winning Oscars for La La Land and Tonys for Dear Evan Hansen. Plus they are really terrific guys who have an amazing sense of musical-theater history. 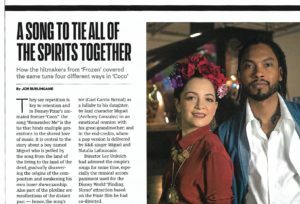 This entry was posted in Composers, Film Music, Interviews and tagged Benj Pasek, film musicals, Hugh Jackman, Justin Paul, Michael Gracey, P.T. 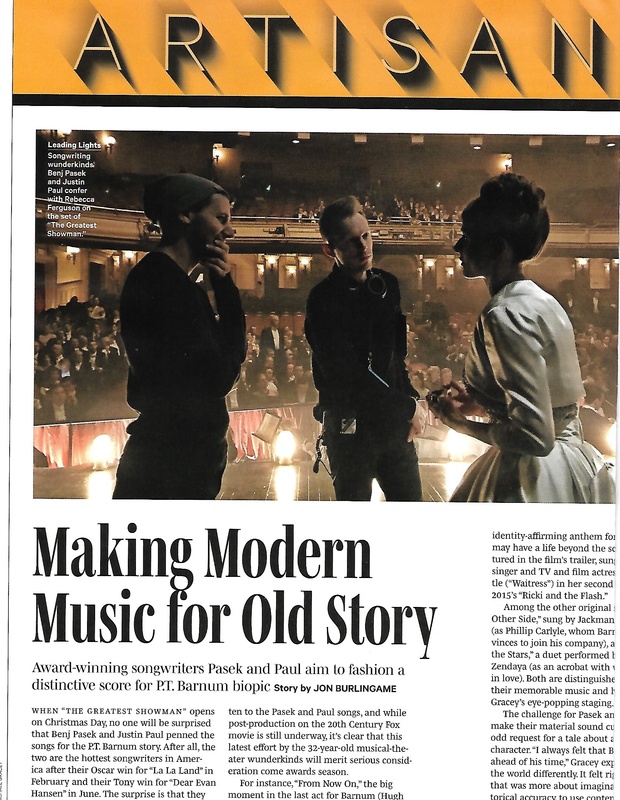 Barnum, Pasek & Paul, The Greatest Showman, Variety on September 28, 2017 by Jon Burlingame.